I love the cloud. My Word files and Excel spreadsheets are stored there, and my wife uploads cute pictures of the grandkids to the cloud. No more worries about backing up the computer or about what will happen to our life’s data should it burst into flames. Best of all, I can access all my information from my smartphone, laptop or tablet whether I’m waiting in line for a cappuccino or sitting in a conference room. Software developers love the cloud too. Microsoft, for example, offers subscriptions to its Office suite, making version upgrades and security patches as necessary as floppy disks. And the company’s Azure hosting platform could very well revolutionize the way businesses manage their information technology services. Starting at around $15 per month per machine, you can log on to Microsoft’s Web site, order a virtual server and deploy software to your company’s user community within minutes. The software giant isn’t the only one. NetSuite, salesforce.com, Jive Software, Dropbox, Evernote—these are just a handful of the cloud-based software companies transforming the way we live and work. Borrowing from the late Steve Jobs, the cloud changes everything. One of the functions of the cloud is to provide software programs to users without the hassle of actually installing it. Instead, a Web browser or small bit of software known as a client is used to share information with a group of computers or servers. These servers are housed in one of thousands of data centers around the world, facilities with security measures in place and tended by IT acolytes dedicated to the care and feeding of huge mainframes. Granted, cloud computing isn’t quite that simple. It requires a new way of thinking about software development and deployment. This might explain why CAD/CAM developers have been slow to embrace the cloud—but that attitude appears to be changing. 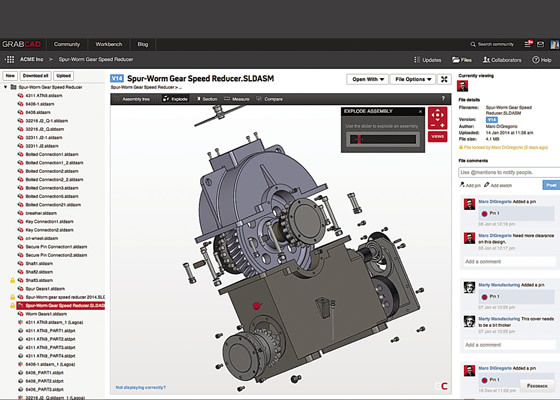 One example is the release of San Francisco-based Autodesk Inc.’s first cloud-based design tool, Fusion 360. This entry was posted in CAD/CAM/FMEA and tagged CAD, CAM, Cloud, cutting tool engineering. Bookmark the permalink.